Admixture can be used for surface preparation prior to tiling but it is commonly used with standard tile adhesives to improve flexibility. Admixture can be used in areas where you might require increased durability, movement or vibration and in places where reduced porosity is needed. 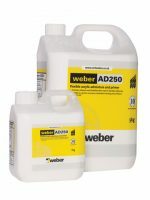 Add admixture to the recommended adhesives and grouts in order to fix wall tiles or floor tiles onto low porosity substrates or areas where movement is likely such as environments with underfloor heating in place. It is also great for fixing porcelain tiles and admixture can be added to grout too, allowing you to apply your tiles with ease and efficiency, leaving you with a fantastic, reliable finish.